Maybe you're one of the gamers out there who simply can't have enough power coming from the graphics department or maybe you want to assemble a gaming rig with a given budget and you want to get the very maximum out of it. 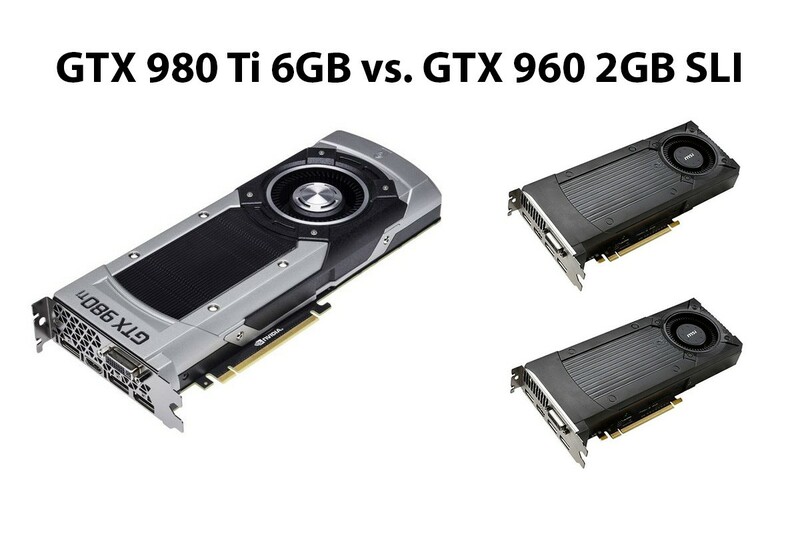 In both cases the following article might be interesting and it might be quite surprising to see how two GTX 960 in SLI stack up against a mighty GTX 980 Ti. We're finally back with our "versus" articles. Compared to the old ones we've reworked our template and you might have noticed that the navigation is not structured by games anymore but by resolutions. We're testing the three most important resolutions 1080p, 1440p and UHD all at high-details, which is going to put massive load on the GPUs, especially in the case of UHD. Regarding UHD we only test cards with 4GB of VRAM and above, since cards with 2GB or 3GB simply aren't sufficient. Like in the past, we'll also have a look at power consumption, noise levels and temperatures of the particular cards. Last but not least you'll find our conclusion on whether we'd recommend an upgrade or not on the last page. We've decided to keep that part pretty short, since the test results on the previous pages are speaking for themselves.